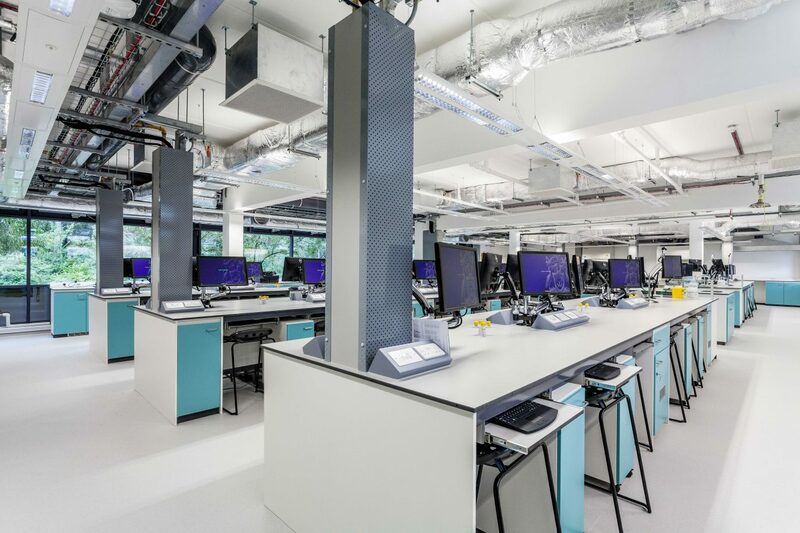 One Lab Space. Four Separate Lectures. Simultaneously. Faculty of Medical Sciences is one of the fastest growing faculties at ARU. As reputation grows and newer courses introduced, two concurrent challenges had to be addressed. › The demand for available teaching spaces has multiplied significantly. 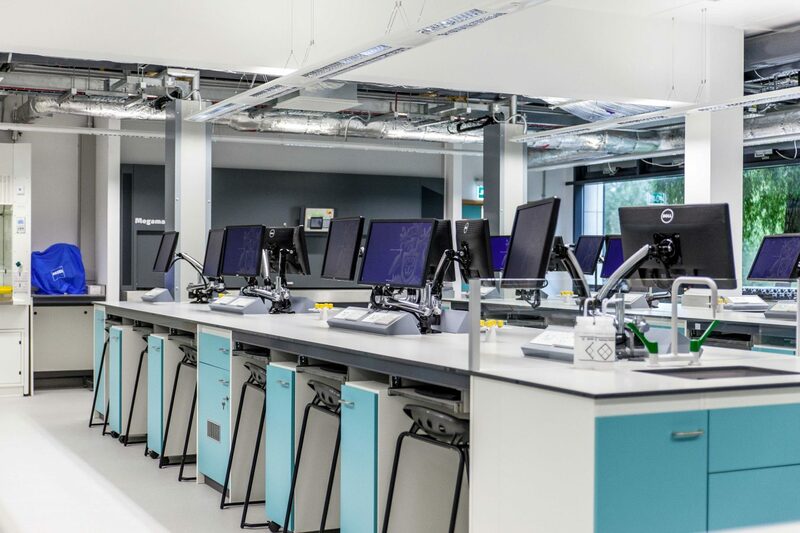 › Internal student feedback surveys indicated “overcrowded laboratories” as a factor affecting the overall student experience. 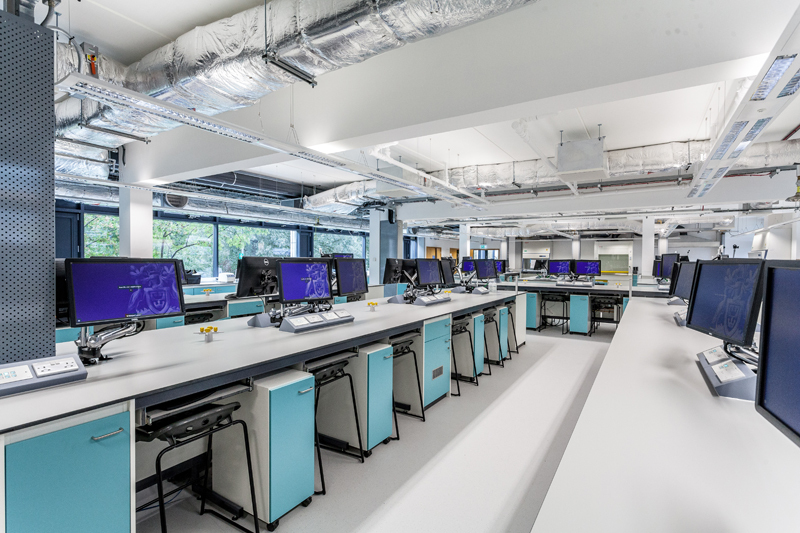 Remodelling three labs into one large laboratory space delivering up to four separate lectures to eighty students, at the same time, even though students may not be seated at the same bench as their respective lecturers. Particular emphasis was placed on systems design for greater flexibility in use of the space. Once a lecturer starts a session at their designated control panel, students can choose the same channel to begin receiving lecturer video and audio feeds. 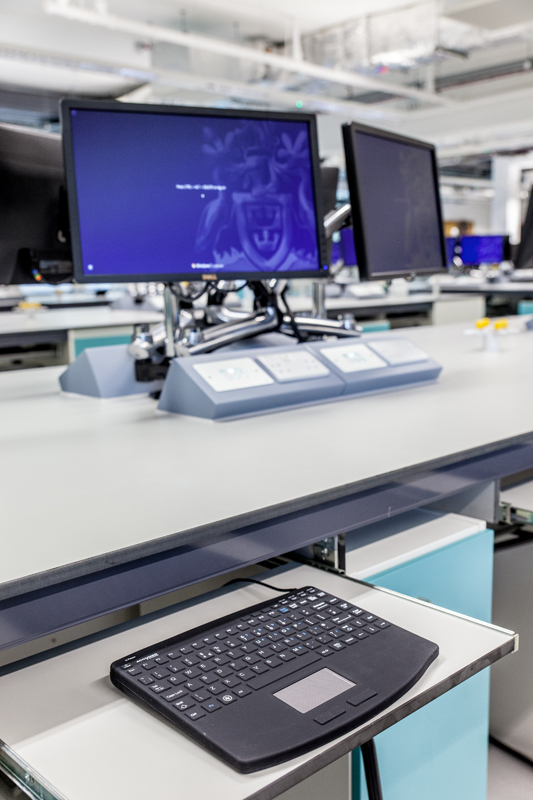 Lecturers can exhibit live lab experiments using a GoPro Hero 4 camera (their rugged build was judged ideal for a Science lab), alongside a desktop webcam (students also have a Picture-in-Picture option at their own stations). 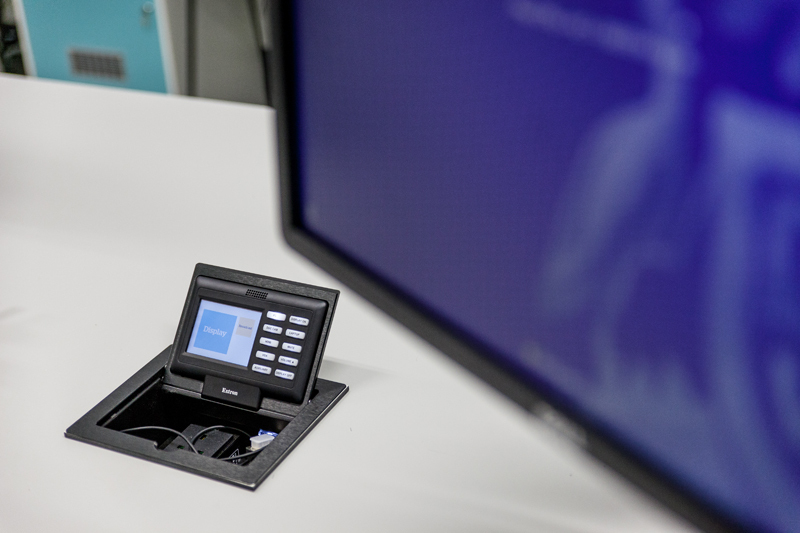 Lecturers can also play video and/or audio content from a desktop PC (HDMI/VGA output) at their station or a Laptop. Lecturer positions are also equipped with wireless micro-phones, which transmit voice feeds to student positions. Each student receives audio feeds through a clip-on radio receiver, which support standard noise-cancelling headphones. To allow greater capabilities for instructional learning, the infrastructure supports lecturer audio alongside Laptop/PC content shared with students (for example, lecturer’s live commentary while students watch a YouTube clip played by the lecturer on their individual displays). 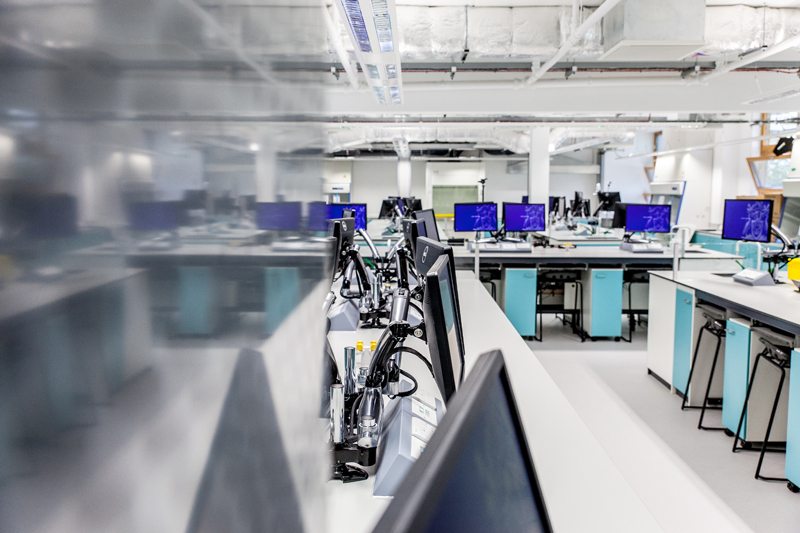 There was the lack of dedicated space for an IT hub and a vast majority of equipment had to be accommodated within the lab itself. We found a solution in a noise proof and air-conditioned APC “server room in a box”, with the objective of minimising clutter and compromise on student’s desk space. 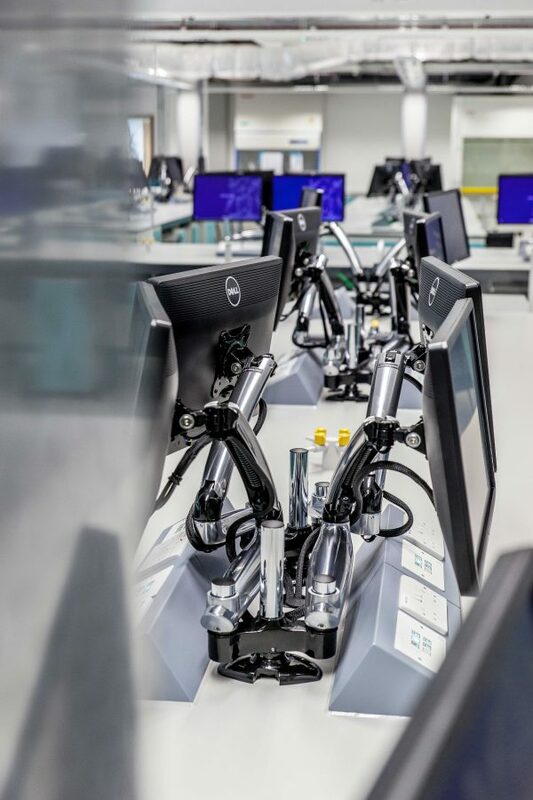 SuperLab, therefore, was not only a whole new way of teaching but also a project with limitless scope for innovation in design, systems integration and miniaturisation, particularly with respect to customisation in collaboration with specialist suppliers. 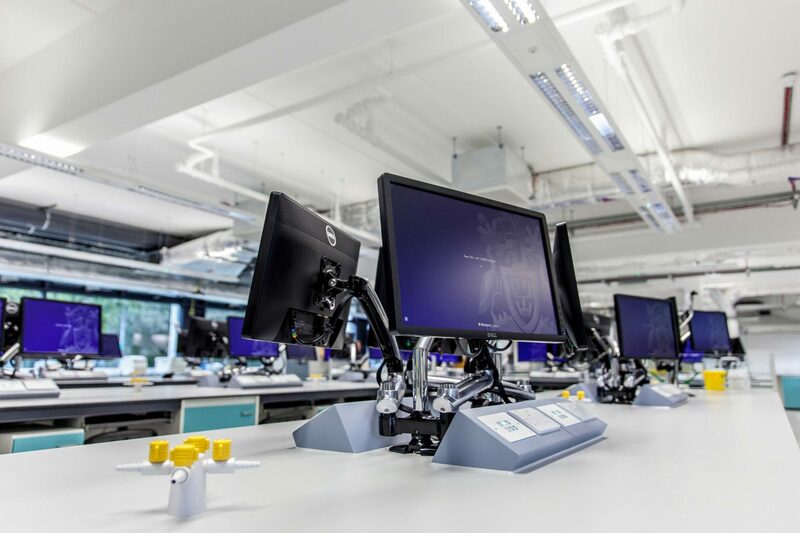 › Fully-functional science laboratory; teaching space for up to eighty students. › Open ceiling access to utilities such as gas, water andelectricity. › 50 cupboards ranging 500-1000 mm. › Seven student benches, equipped with washing stations. › More frequent timetabling of multiple lectures. › Reduced operating cost compared to multiple teaching spaces, each with their own AV maintenance/operation costs. › Reduced stock costs owing to standardisation. › Reduced operational pressure on existing teaching spaces and the need to build new additional spaces. › Brand new teaching space, which is first of its kind in UK. 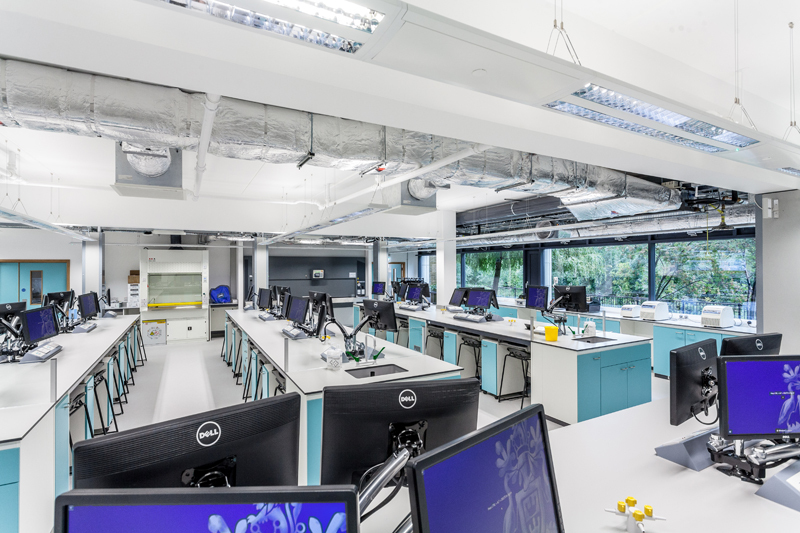 “Superlab has had a clear impact on the course of our future business plan, as it has allowed us to bring in higher student footfall in a range of disciplines that we could not previously accommodate alongside existing courses. This allies directly with our business development plans, and we see it as the first major step in a grand plan to extend our offerings in laboratory based and medical courses”. Learn more about how Superlab works. 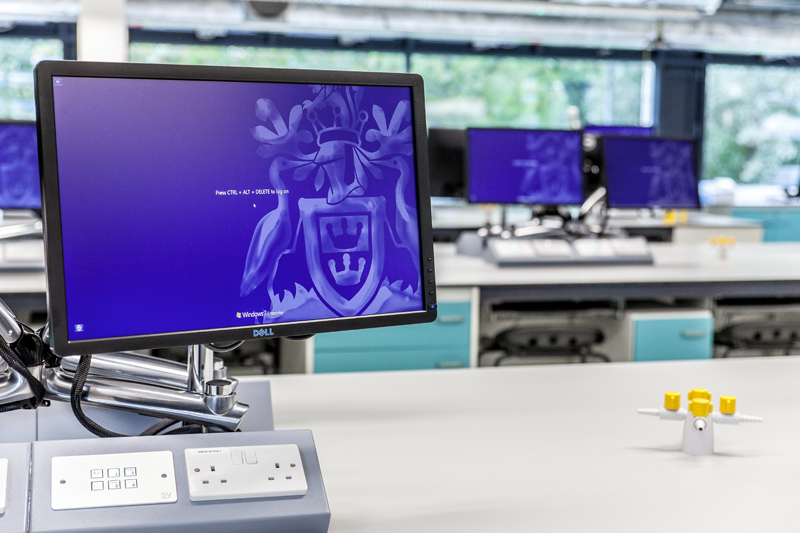 Making AV investments deliver profitable results for Anglia Ruskin University. #SwitchOnthepossibilities.